BLOOMINGTON, Ind. -- Indiana University professor Elinor Ostrom and the Workshop in Political Theory and Policy Analysis have been awarded a $295,000 grant from the Fannie E. Rippel Foundation to explore applying Ostrom's theories and insights to health and health care. The 18-month research project will be led by Ostrom, Distinguished Professor of Political Science and the 2009 co-recipient of the Nobel Prize in Economic Sciences, and Michael McGinnis, IU political science professor and director of the Workshop in Political Theory and Policy Analysis. 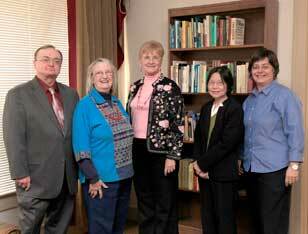 Members of the IU health commons research team include, from left, Michael McGinnis, Elinor Ostrom, Kathleen Gilbert, Joan Pong Linton and Claudia Brink. The study will apply methods of institutional analysis, as developed by Vincent Ostrom and Elinor Ostrom and their colleagues and collaborators, to the common resource pools most critically involved in the health system. The Rippel Foundation hopes this analysis can help Americans become healthier while paying lower and more sustainable costs for high-quality health care. "The Rippel Foundation is excited about the prospect of extending Professor Ostrom's work to health care," said Laura Landy, president of the Rippel Foundation. "Managing the health care commons is a crucial challenge for our nation and the world, and Lin Ostrom and her team are uniquely qualified to lead that effort. We hope that this project will result both in valuable new insights and in practical tools for health care leaders and concerned communities." "The Rippel Foundation's support is making it possible to explore the application of a totally different set of proven economic theories that could have profound and practical application to health care," Ostrom said. "The challenge of using well our common shared resources in health and health care is of utmost importance if we are to reach the goal of a healthier population and a sustainable health system. We're thrilled at the opportunity to contribute new insights to meeting that challenge." The project will include in-depth studies of four diverse regions: Cedar Rapids, Iowa; Grand Junction, Colo.; and Bloomington and Bedford, Ind. Each of these communities has differing experiences with collaborative models of governance, many of which have been focused on health. In cases where sustained collaborative management practices have been in place, the result seems to be higher-than-average quality of health care at lower-than-average costs. Among the project's outcomes will be insights into new economic models, as well as surveys, assessments and other measurement instruments that can be used in regions across the country, if these communities can first be understood. Other IU research team members include senior researcher Kathleen Gilbert, professor of applied health science, and co-investigators Claudia Brink, assistant director of the Workshop in Political Theory and Policy Analysis, and Joan Pong Linton, associate professor of English. "I am impressed by the diversity of formal organizations and informal practices already in place in the health policy area, built by stakeholders struggling to cope with their difficult problems of collective action," said McGinnis, who will serve as principal investigator for the project. "I welcome this opportunity to contribute some ideas about how these institutions might be inter-connected in a more effective manner, since even more daunting challenges await us in the near future." The advisory committee for the project includes Elliott Fisher, director of the Dartmouth Center for Health Care Research and Reform; Robert Gibbons, professor of management and economics at Massachusetts Institute of Technology; Marshall Ganz, lecturer at the Harvard Kennedy School of Government; and Ruth Wageman, associate faculty member in psychology at Harvard. Elinor Ostrom, in Governing the Commons (1990) and many other publications, demonstrates how local communities develop and sustain habits of collaboration that enable them to effectively manage resources critical to their own survival. She summarizes this research by identifying eight principles of design that are common to examples of long-lasting regimes of resource management. In the Rippel Foundation-funded research, the project team will investigate the extent to which similar principles of multi-stakeholder polycentric management can be applied to health policy. Ostrom was awarded the 2009 Nobel Prize in Economic Sciences for her research on "economic governance, especially the commons." Prior to her research, established economic theory predicted that users of common resources were doomed to suffer a "tragedy of the commons" -- the total collapse of a sustainable system due to overuse. Yet by looking at examples of common pool resources such as forests, fisheries, oil fields, grazing lands, and irrigation systems around the world, Ostrom concluded that conditions found in many real-world communities made it possible for them to work together and avoid a tragic fate. The Fannie E. Rippel Foundation is a catalyst for new ways of thinking about our health system - to achieve better health, better care and lower costs. The foundation actively engages leaders in and outside of health who take a systems-based approach to health and care re-design, working with them to explore and implement innovative initiatives in order to improve health outcomes for all Americans. For more information see www.rippelfoundation.org. The Workshop in Political Theory and Policy Analysis was founded by Vincent Ostrom and Elinor Ostrom to promote the interdisciplinary study of institutions, incentives, and behavior as they relate to policy-relevant applications. The central themes of Workshop research include self-governance and democratic reform, as well as collective action in the context of sustainable natural resources. For more information see www.indiana.edu/~workshop.